The fight against lung cancer doesn’t have to be a solo battle. To help Filipino patients and their loved ones rise above this challenging condition, biopharmaceutical company AstraZeneca has partnered with the Philippine Society of Medical Oncology (PSMO), along with local support groups such as the Cancer Coalition Philippines (CCP), and the Philippine Alliance of Patient Organizations (PAPO) to launch LVNG With Lung Cancer, an online resource portal for patients across all stages of the disease. 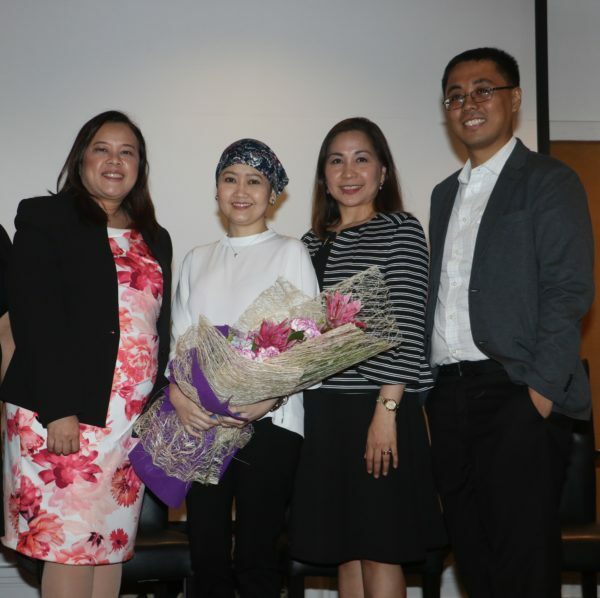 From left: Dr. Mary Claire Vega-Soliman, President of the Philippine Society of Medical Oncology and Head of the Tumor Clinic of East Avenue Medical Center; Carla Comendador Britanico, a patient living with Stage IV lung cancer for more than 6 years; Dr. Ma. Luisa T. Abesamis-Tiambeng, Director of the Cancer Center at the Cardinal Santos Medical Center; and Dr. Paolo dela Rosa, Medical Advisor and Medical Oncologist at AstraZeneca Philippines. Lung cancer is the top cancer killer worldwide, with 2.09 million incidences and 1.76 million fatalities this year alone according to the GLOBOCAN 2018 report by the International Agency for Research on Cancer (IARC). But while a majority of lung cancer deaths involve tobacco use, non-smokers are also at serious risk. A 2015 study on the European Respiratory Journal notes that about 25 percent of lung cancer incidences are not linked to smoking, and that the rate of never-smokers diagnosed with the disease has been increasing. The American Cancer Society identifies several causes, such as exposure to second-hand smoke, diesel exhaust, asbestos, radioactive radon gas, and chemicals released by burning coal products. Adding to the stigma, new patients tend to think that their illness is a hopeless case. This leaves them with a sense of isolation that worsens their anxiety over their diagnosis. LVNG With addresses these stigmas by dispelling myths that prevent lung cancer patients from seeking proper treatment and seeing hope in their condition. The community also empowers patients with information that enable them to reach out to medical professionals so they can learn more about treatment options. Dr. Mary Claire Soliman, president of the Philippine Society of Medical Oncology and member of Cancer Coalition Philippines also emphasizes that, “Standard evidence-based medicine is the way to go in treatment. I understand how the promise of alternative medicines (‘natural”, “herbal” or “nutraceutical medicine”) may be tempting, especially with their claims that they do not have side effects. The fact of the matter is that there is very little evidence to support these claims. Chemotherapy—or the use of drugs to kill and stunt malignant tumors—is usually thought of as the only treatment for cancer. “The fact is, various options are now available depending on the patient’s diagnosis, preference, and recommendations from the healthcare team. Among these include surgery to remove affected lung tissues, radiation therapy that use high doses of radiation to destroy cancer cells, and targeted drug therapy.”, Dr. Maria Luisa Abesamis-Tiambeng of Cardinal Santos Medical Center emphasized. Targeted drug therapy may be recommended based on biopsy findings. Through biomarker testing, the biopsy can reveal genetic mutations in cancer cells that can be targeted by drugs designed to zero in on those cellular abnormalities. Therapeutic advances have made targeted drug therapy the standard of care for personalized medicine in the fight against certain lung cancers. One breakthrough is Tagrisso (Osimertinib), an oral tablet from a class of drugs called tyrosine kinase inhibitors (TKI) that target tumors with epidermal growth factor receptor (EGFR) mutations. Tagrisso (Osimertinib) is a third-generation EGFR TKI that has shown better precision and power at stopping lung cancer growth and improving patient survival. A double-blind FLAURA study shows that Tagrisso delivers 18.9 months of median progression-free survival, nearly twice as long as older drugs that deliver a median of 10.2 months. Tagrisso (Osimertinib) also reduces the risk of lung cancer metastasis on the central nervous system by 52 percent, and lowers the risk of death by 37 percent based on its preliminary data. “These results have made Tagrisso (Osimertinib) the recommended and preferred first-line treatment by international guidelines for advanced and metastatic non-small cell lung cancer—the most prevalent type of lung cancer—that tested positive for EGFR,” Dr. Josue adds. EGFR biomarker testing is available across laboratories and hospitals nationwide including the Chong Hua Hospital, Hi-Precision Diagnostics, Lung Center of the Philippines, Manila HealthTek Inc., National Kidney and Transplant Institute, St. Luke’s Medical Center Global City, and The Medical City. Learn more about LVNG With Lung Cancer at www.lvngwithphilippines.com or www.lvngph.com.